These Knees is a modern-day rock band that makes its home in Cleveland, OH. The band consists of singer/songwriter/guitarist Stephanie Trivison, bassist Eric Piontkowski and drummer Rob Hassing. Led by Stephanie Trivison who writes the songs for the band, These Knees creates their music by taking many different influences like Classic Rock icons The Beatles and more recent bands like Paramore and Tegan and Sara. The result of those influences creates a musical sound that sounds both retro and modern at the same time. The band’s unique take on modern-day Rock and Roll can be found on their 2013 release entitled The Young and The Bright. The Young and The Bright from These Knees begins with the track “Erie (Promise Me)”. The track begins with a very light guitar part with Trivison basically singing a’cappella and then harmonizing with bandmates Piontkowski and Hassing with Bobby Vaughn adding more fullness to the mix. The track features a sound that brings to mind the songs of the “girl groups” from the 1960’s like The Supremes, The Shirelles and many others. That classic rock sound is combined with a more modern rock feel. The song features a chorus that is very addicting and along with the rest of the elements included in the song, it helps make the song one of the best tracks on the new release from These Knees. The new release from These Knees continues with the track “Pacifica”. With this track, the band picks up the pace of the music and creates a track that ends up being light and fun to listen. One of the most apparent things in the song is the guitar playing of Stephanie Trivison. With this track, she proves she can definitely hang with the best of them. The obviously strong “pop” feel of the music helps makes the song move smoothly. The listener will ultimately wish that the song was longer, even though the track runs over three-and-a-half minutes. After two songs of quick-paced Pop music, the band slows things down with the song “Addicted”. The song takes on a slightly folk-rock feel to it. The lyrics track of the song finds Trivison looking back at a relationship while stating that she will survive with no regrets. The slower pace of the track emphasizes the feeling of the lyrics sung by Trivison as she speaks her mind and lets her feelings be known. These Knees picks up the pace of their album with the track “Break Science, Make Art”. The mix on this track brings Eric Piontkowski’s bass a little bit more to the forefront of the song, giving the track a stronger feel than the previous songs on the album. That stronger feel makes the song rock harder than the earlier and makes it one of the strongest tracks on The Young and The Bright. Another strong track on the new album from These Knees is the song “The New Year”. This track takes the music of the band in a direction that brings the band closer to today’s punk-pop bands like Simple Plan or American Hi-Fi. This track brings the band closer to mainstream radio artists than many of the other tracks included on the album. Along with the music that takes the band’s song in that pop-punk direction, the vocals from Stephanie Trivison brings to mind a style that is reminiscent of singers from current punk-pop bands like those already mentioned. The song begins with a quick-paced feel but slows down rather close to the end of the track as an additional group of singers is brought in to add a choir-like vocal to it. The song eventually comes to an end as that choir helps fill up the background with more vocals. While most of the album contains guitar-based music, the track “Ohio” is slightly different as it features Stephanie Trivison creating a different approach on this track. While the song of “Ohio” is still guitar-based, Trivison also adds some variety to this track by adding organ to the song. That organ begins the track before Trivison’s guitar and Eric Piontkowski’s bass and Rob Hassing’s drums come in to complete the sound of the track. The organ makes several appearances on the track and gives it a unique feel among the songs included on the release. Stephanie Trivison and her band These Knees have created a release in The Young and The Bright that is just what you want as they continually change directions in their sound; sometimes pop-rock, sometimes punk-pop and sometimes they incorporate older influences like Girl Group rock and roll. But through it all, the new release from These Knees is an album of Rock and Roll that never falters and never fails to deliver an enjoyable listening experience. Check out the video to “Erie (Promise Me)” from These Knees by clicking on the link. 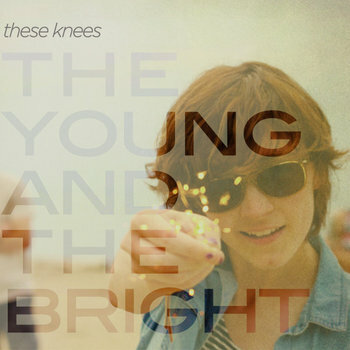 To check out The Young and The Bright by These Knees, check out the band’s Bandcamp Profile.